The theory known as Embodied Cognition argues that cognition is shaped by bodily experiences in interaction with the world, and is not just a matter of representation in the brain. The amounting evidence for this theory has led educational researchers to include data of action (hand movement) and perception (eye movements) in studies of learning, even in the domain of abstract mathematics. Moreover, educational researchers also think through the implications for embodied design. In the current project, we apply this theory to the domain of mathematics, since it is what many learners struggle with due to the difficulty of visualizing or materializing its abstract concepts. 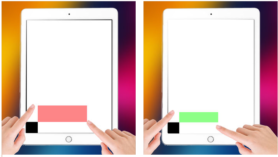 We are a team at Utrecht University, Netherlands that together with our international collaborator Dor Abrahamson from University of California, Berkeley, have designed an embodied touch-screen application (Figure 1) for students to learn interactively how to solve a simple proportion problem such as 2:4 = 4:? (Figure 1). See the Instruction. We have conducted eye-tracking studies with over a 100 students in primary and vocational schools (age 9-12), and recorded the hand movement, gaze behavior and thinking aloud conversation of the students. We study how action (what students do), perception (what they see), and reasoning (what they say) interact to solve proportional tasks without formal mathematical instruction. We have found that children are creative and successful in their problem solving with the app, with no explicit instruction on mathematical proportion during the task. Also they sometimes think in terms of geometrical concepts that are not visualized in the interface. This project challenges you to think about alternative, embodied ways in which students may acquire mathematical knowledge. It offers a methodologically challenging micro-study of mathematics learning. We continue data collection and analysis to investigate how the app can stimulate and support proportional learning. For example, how does the addition of geometrical shapes and lines (slopes) alter the way students act, perceive and reason? (Figure 2). The long-term goal of this project is to explore how mathematics education can benefit from embodied cognition research so that students can ultimately develop a better grip on mathematics. Figure 2. Different conditions of the app with the same proportional problem.